"Jalapeno peppers and fresh mint add fun flavors to a fresh limeade." Tasted kind of medicinal. No kick at the end, but I could definitely taste the jalapenos. Mainly, it wasa just sweet. Perfect!!! The jalapeno (1) was just enough for a little kick. Did not taste the mint leaves, will add more next time. Delicious!! Delicious! It was sweet at first, but then had a kick at the end. 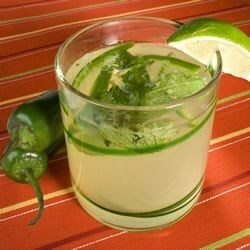 We used two jalapeños, but it drowned out the mint flavor. Will use again! Made this for a Cinco de Mayo potluck at work today, fabulous! Everyone loved it! Very unique, crisp, and refreshing. I doubled the recipe and used one very large jalapeno (seeds removed). Delicious! However, if I were to make it again, I would only use 1/2 a jalapeno, since I don't handle spice very well, but it was still delicious. I'm a big fan. One has to like spice to enjoy this fully. Awesome recipe! I added another mint sprig and decreased the jalapeno. I also cut down on the sugar a bit and thought it was perfect.